Magical. Breathtaking. Incredible. Amazing. Effortless. 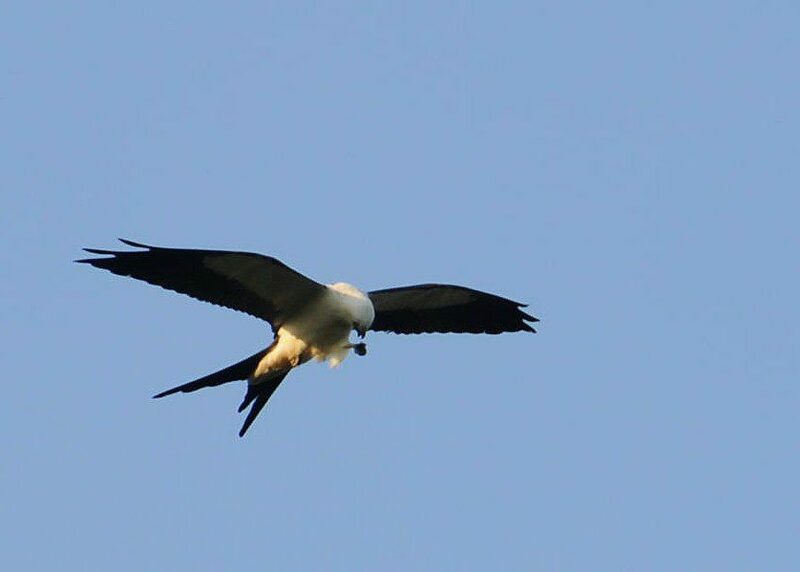 All are barely-adequate adjectives used by observers attempting to describe the flight of the Swallow-tailed Kite that traced graceful lines through the sky at Middle Run Natural Area last weekend. The flight of the kite on Saturday evening is seared in the memories of those who witnessed it first-hand. Dramatic powerful glides skimming the tops of the pine trees, then a quick fold of the wings and a twisting downward dive in pursuit of a dragonfly. Rising back up, the kite would circle back and dive again. On the successful attempts, the kite would emerge clutching a Green Darner dragonfly in his small yellow talons, and proceed to tear the insect to pieces with his sharp beak. Dinner on the wing, and then back for seconds. And an extra helping of dragonfly for dessert! Talons to beak, the Swallow-tailed kite polishes off another dragonfly morsel. Image by Derek Stoner. 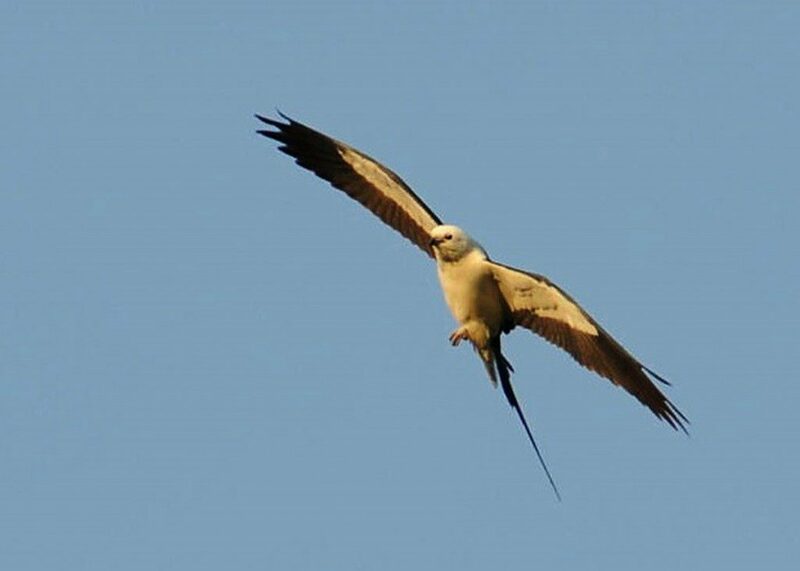 There are currently 15 total records ( with 11 officially accepted so far) of Swallow-tailed Kites occurring in the State of Delaware according to Frank Rohrbacher of the Delaware Bird Records Committtee, so this bird is still quite a rarity. In almost all cases, these kites are seen flying over in the spring, gliding on by and sending folks scrambling for their cameras. 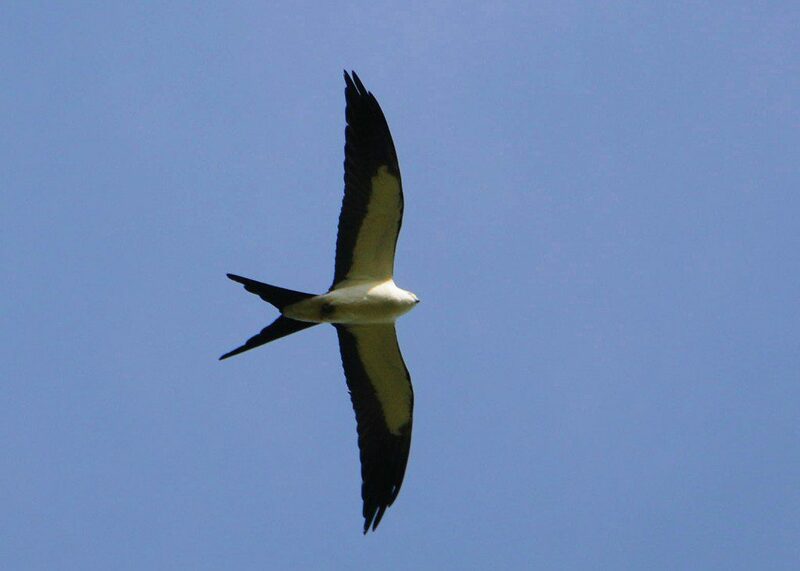 For a Swallow-tailed Kite to stay in one place for two days and be the subject for literally thousands of photos is a testament to the uniqueness of this occurrence. 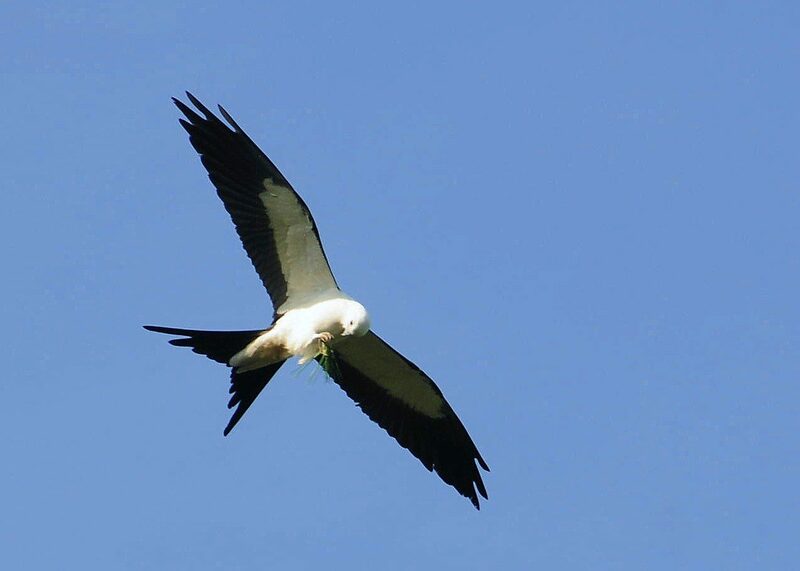 The Swallow-tailed Kite is admired by all who witness its flight. Image by Derek Stoner. With a wingspan of four feet and weighing an average of 15 ounces (yes, barely one pound!) the kite is a flying machine par excellence. Kites rarely flap their wings, instead using their incredibly long tail to guide their body throgh the air currents as their wings take them for a ride. Enjoy watching the video– if you missed seeing the kite, you can at least experience its flight through the wonders of technology! Swallow-tailed Kite at Middle Run! “You are not going to believe this!” The call came in from an excited Angel Burns, who described a bird she had seen while hiking with her daughter at Middle Run Natural Area this afternoon. Two-year old Shay pointed out the unusual bird, and mother and daughter enjoyed a special audience with this spectacular bird for fifteen minutes as it soared effortlessly above their heads. “You are not going to believe this, but I think it is a Swallow-tailed Kite!” I did not doubt her observation one bit, as the Swallow-tailed is simply known as the “Flying Fieldmark.” That incredible shape, with long wings and a long forked tail, is unmistakeable. The stark black and white pattern makes it evern more uniquely beautiful. I quickly posted this incredible report to the Delaware Birds email alert, and immediately zipped down to Middle Run to see if I could re-locate this amazing bird. Eating on the wing, a Swallow-tailed Kite devours a dragonfly freshly plucked from the pine trees. Image by Derek Stoner. It goes without saying that a bird like this stands out, and in short order the kite was spotted in the distance. It then looped overhead and descended back into Middle Run’s hayfields along Possum Park Road. For over two hours, the kite soared back and forth over a grove of White Pine trees, diving dramatically into the trees and coming back up with dragonflies that it snagged with its tiny talons. A crowd of thrilled birders gathered, savoring the sight of this fantastic rarity. In late April into May, Swallow-tailed Kites often “over-shoot” their southern breeding grounds and wander north. Carried by strong south winds and gliding, well, like a kite, these birds can travel tremendous distances in a short time. just this past week in New Jersey, at least three different Swallow-tailed Kites made the bird hotline news. There is much more to this fascinating story of the Swallow-tailed at Middle Run. A good bit of video showing the acrobatic flight of the kite will surely be shared soon. Stay tuned for more on the kite report! 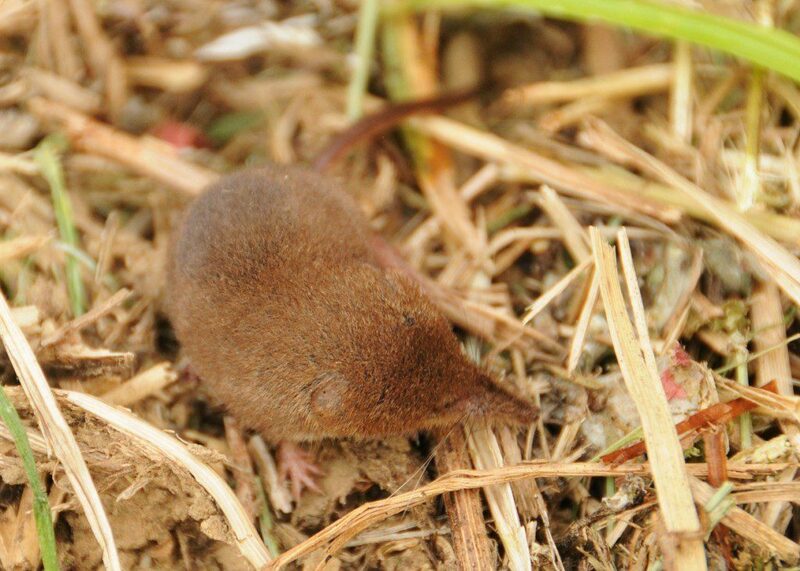 A Least Shrew prowls a meadow in pursuit of insects and other tiny invertebrates. Image by Derek Stoner. Not many people keep mammal life lists. Plenty of folks keep careful records of all the birds, butterflies, dragonflies, or reptiles and amphibians that they observe. But I suspect that the mammal family gets short shrift from the “listers” out there. A lot of that reason is because of how difficult it can be to observe mammals well in the wild. Sure you see deer, squirrels, and groundhogs, but have you ever seen a Least Shrew? Up until a couple weeks ago, the answer for me was “No!” I’ve been fortunate to have brief glimpses of small rodents thorugh the years, mostly scampering Meadow Voles and skittering White-footed Deer Mice. I find small mammals to be fascinating since they form the prey base for the big critters we know well, like Red Foxes, Red-tailed Hawks, and Great-horned Owls. Most small mammals spend their time underground or otherwise hiding very well from these predators, and are exceptionally difficult to observe in their natural habitats. Photographing them alive(and in the open) is nearly impossible! 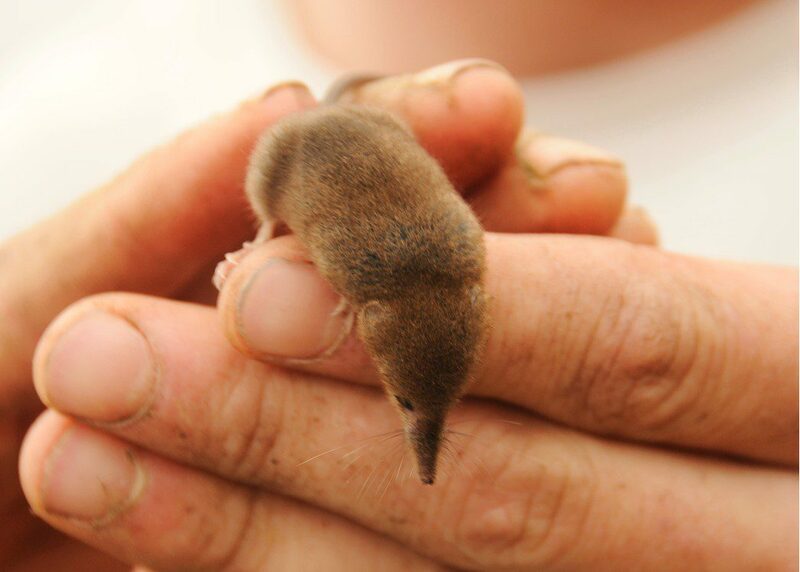 An adult Least Shrew in hand-- three inches of boundless energy! Image by Derek Stoner. While working in the tree planting field at Middle Run Natural Area recently, Steve Johnas and I spotted a tiny brown mammal scampering through the grass. I ran over and managed to capture the little guy. It turned out to be a Least Shrew– at last! I’d seen a few dead specimens of this species, but now I was holding a real live one. And it felt like holding nothing! Soft, lustrous brown fur cloaked the body, and the incredibly-long snout looked comical. This appendage helps these insectivores sniff out their prey while hunting in fields and brushy meadows. The shrew seemed to grow comfortable with being handled, but I would not say that this was a case of the “Taming of the Shrew.” We let him go to see how he would go about his normal business. We watched this diminutive mammal ramble along through the dried grass, its long snout guiding its exploration. Pausing to poke its nose into crevices, the shrew kept a frenetic pace as it searched for food. Lots of crickets and grasshoppers lurk in this field, and Least Shrews are known to open up the abdomens of these orthopterans and eat the internal organs. Sounds delicious! Getting a small mammal to pose on a perch is very rare and not easy! Image by Derek Stoner. 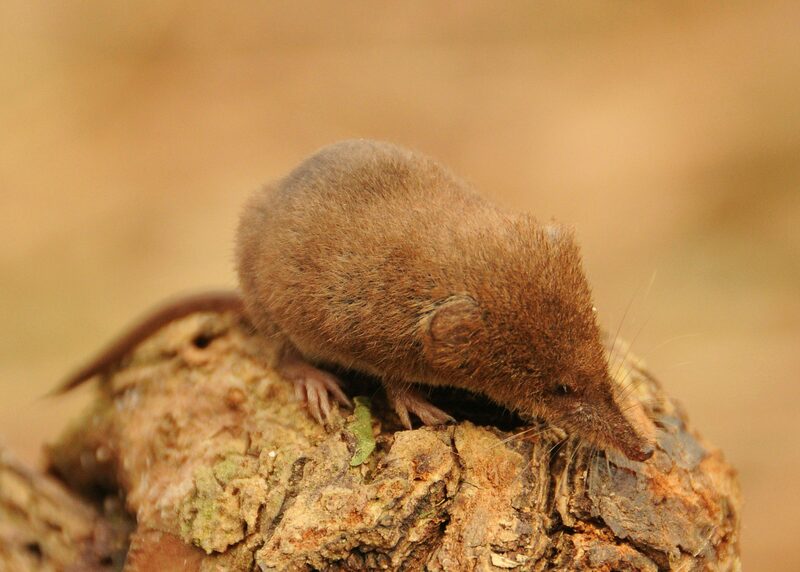 The Least Shrew has a fast-burning metabolism and lives a very brief life. The oldest in captivity lived to the ripe age of 21 months, but most never make it to the 12-month mark. Mostly these creatures eat and reproduce during their short lifespan, so there’s little need to sleep and rest. Our smallest local mammal weighs in at around 5 grams(as much as a nickel) and attains a length of 3 inches, including the tiny tail. We count ourselves lucky to have spent a bit of time with the amazing Least Shrew, an incredible native mammal. Maybe you’ll see one some day! Middle Run Natural Area, north of Newark, is an 850-acre county-owned park. A reforestation project coordinated by the Delaware Nature Society over the past 20 years has helped to plant nearly 40,000 trees that provide over 50 acres of excellent early-successional habitat. A great diversity of wildlife benefits from this major conservation project, with Least Shrews just one of the amazing species that lives here.